Just About Anything: Do Best and Lovely Go Together? My new online pal Janis of The Foodie's Food Trip so thoughtfully sent me these two awards: Best Blog Award and A Lovely Blog Award. These were really unexpected and I really appreciate the thought. I really enjoy receiving awards... They are silent testimonies that people find my blog interesting and worth mentioning. A big THANKS for thinking of me Janis. Who is Janis, by the way? Get to know her more and read about her adventures and mishaps in the kitchen. Amateur as she may be at cooking, her food blog sure does offer some funny anecdotes and interesting cooking tips. Do check out her blog. 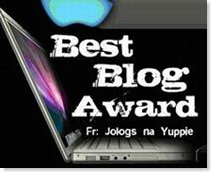 Pass the award to 15 other blogs that you’ve discovered and think are great! 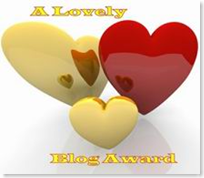 Remember to contact the bloggers to let them know they have been chosen for this award. I won't be passing this on since I am still too exhausted from out trip. But you are free to grab them!